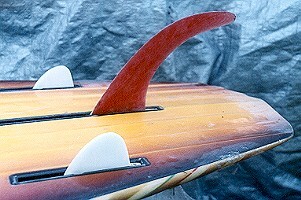 1976 Crozier Tri Fin Slab Kneeboard 5 ft 7"
Foam blank with 1/4" redwood stringer. Multi sprayed. One 14" and two 6" finboxes. R/hand plug. two 2 1/2" x 3" base side fins. Severe deck delamination,dinged rails, side fin tab broken. Cleaned, side fin replaced. Additional information and corections supplied, with thanks, by Bruce Hart. Originally designed by Peter Crawford in 1969 at Wallace Surfboards (name credited to Midget Farrelly) as an alternative to the low floatation Greenough Spoon, the Slab has been in constant production in all fin combinations. This example probably early 1980's - plug, fins, spray. Triple fin boxes in the tradition of kneeboard fin variation and experimentation. Surfing World magazine, Volume 20 Number 1 October 1974 pages 17 - 20. 1. McGinness: How to Ride a Surfboard Chapter 6. 2. McGinness: Surfing Fundamentals Chapter 6. Geoff Cater (1999 - 2015) : Crozier Kneeboard, 1976.